There is a good reason Rocky lovers why we here at the Banff office are so proud of the articles we write for you. Without meaning to boast too much (I lie), we are comfortably the best (probably only) local experts when it comes to the towns, activities and accommodations of the Canadian Rockies. Who could resist the temptations of the Canadian Rockies and its locals! A few weeks back, a journalist from the Irish Sun newspaper asked me to show her around Banff and the Rockies for a piece she was writing.It is not the hardest job in the world to impress a pretty journalist around a town like Banff. The Banff Gondola was the first port of call followed by some casual shopping among the many gift shops and finished off by a posh dinner at La Beaujolais. As I picked up Helen from the Banff Springs the next morning, she wasn’t expecting to see many better sites than she already had in Banff especially when she saw my pink not-so-regal Ford Station wagon “limo” that arrived to pick her up. 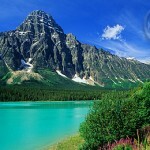 However, there is no one in the world that wouldn’t be moved by the striking sight of Lake Louise on a sunny day. The Irish Sun has an average daily readership of over half a million and Helen went to pains to point out that the source for much of her information was yours truly and my fellow writers at Rockies.com. There is a reason we are Canada’s Top Read Tourism Portal – just so you know you are in good hands!